Watch this space for developments on the first Invercargill based "People's Show" coming up later this year. Check out the latest on Kevin Downie and his sneaker collection below. 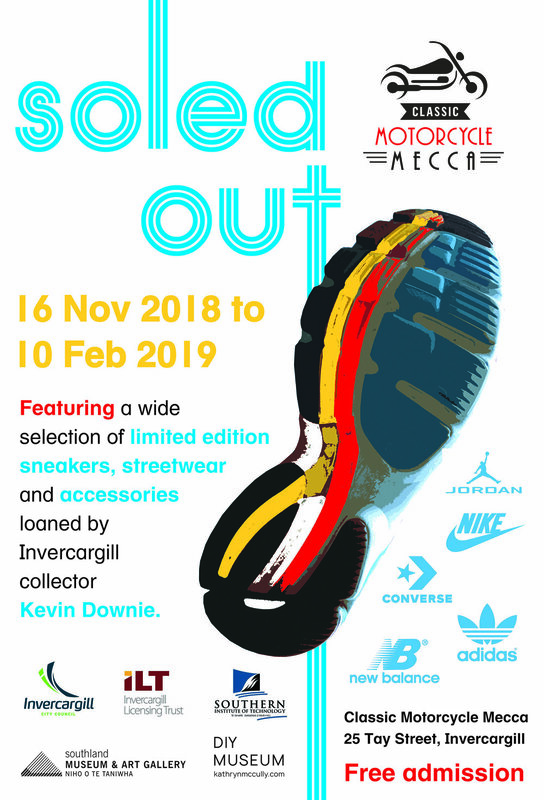 The exhibition, being hosted by Classic Motorcycle Mecca, will not only bring out the sneaker fanatic in you but provide an insight into the sneaker scene, and in particular, trace the personal stories, through street wear and football culture, of a local, self-confessed "Casual". The first People’s Show was conceived in 1990 at the Walsall Museum and Art Gallery. Bolstered by the success of an exhibition showcasing a local’s collection of Native American artifacts, by 1994 the concept had gained so much traction that the People’s Show became a festival with 48 participating venues. According to Walsall Head of Collections, Jo Digger, the festival showcased over 500,000 objects from private collections that were visited by over a million people. She said “…these Shows had something to give to members of the local community, that there were people out there who in their wildest dreams would not have thought of even coming into the museum before they took part in one and that there were many more people out there yet to be encouraged to become involved.” Digger’s statement perhaps speaks to our desire to collect and to share what is deeply meaningful to us regardless of whether that happens to be a collection of ties, rocking horses or motorbikes but also to the public perception that art galleries and museums collect and interpret objects/artifacts that are special or distinct from their own. Accessibility and inclusiveness present as key issues as Digger alludes to the potential of overcoming a museum visitation obstacle, or a sense of exclusiveness, through the exhibition of private collections in a public context. Museum collections and exhibits characterised as worthy of a particular level of care and display become distant from those objects that surround us in our everyday lives. Seeing private collections typically housed in domestic environments treated with the same care as objects/artifacts deemed significant in a museum context, according to Digger, disrupts the perceived institutional boundaries that position some objects/artifacts as inherently more valuable socially and culturally than others. The relationship building required to create The People’s Show demonstrates another aspect of the process conducive to re-orientating the priorities of the museum model from objects/collections to people/communities. Privileging a community’s passion for their own personal possessions over the display of museum collections, re-establishes the significance of the object as both a catalyst for connecting communities and as a vehicle for the sharing of the stories that shape our lives. Digger, Jo. “The People’s Show; One Strategy Towards the Democratic Museum” In Social History in Museums, Journal of the Social History Curators Group, Volume 21, 1994. P40-43. Arnshav, Mirja. “100 Years of Contemporary Collecting: Revisiting the Sailor Tattoos at the Maritime Museum, Stockholm” In Collecting the Contemporary: A Handbook for Social History Museums. Edited by Owain Rhys & Zelda Baveystock. MuseumEtc Ltd, UK & USA, 2014:P235. Benjamin, Walter. “The Work of Art in the Age of Mechanical Reproduction” In Illuminations: Essays and Reflections. Ed. Hannah Arendt. Schocken Books, New York, 1969. Pp225.